L-2-HGA (L-2-hydroxyglutaric aciduria) in Staffordshire Bull Terriers is a neurometabolic disorder characterized by elevated levels of L-2-hydroxyglutaric acid in urine, plasma and cerebrospinal fluid. The mutation, or change to the structure of the gene, probably occurred spontaneously in a single dog but once in the population has been inherited from generations to generation like any other gene. The disorder shows an autosomal recessive mode of inheritance: two copies of the defective gene (one inherited from each parent) have to be present for a dog to be affected by the disease. Individuals with one copy of the defective gene and one copy of the normal gene – called carriers – show no symptoms but can pass the defective gene onto their offspring. When two apparently healthy carriers are crossed, 25% (on average) of the offspring will be affected by the disease, 25% will be clear and the remaining 50% will themselves be carriers. The dog has 2 copies of the normal gene and will neither develop L-2-HGA, nor pass a copy of the L-2-HGA gene to any of its offspring. The dog has one copy of the normal gene and one copy of the mutant gene that causes L-2-HGA. It will not develop L-2-HGA but will pass on the L-2-HGA gene to 50% (on average) of its offspring. The dog has two copies of the L-2-HGA mutation and is affected with L-2-HGA. It will develop L-2-HGA at some stage during its lifetime, assuming it lives to an appropriate age. Carriers can still be bred to clear dogs. On average, 50% of such a litter will be clear and 50% carriers; there can be no affected pups produced from such a mating. 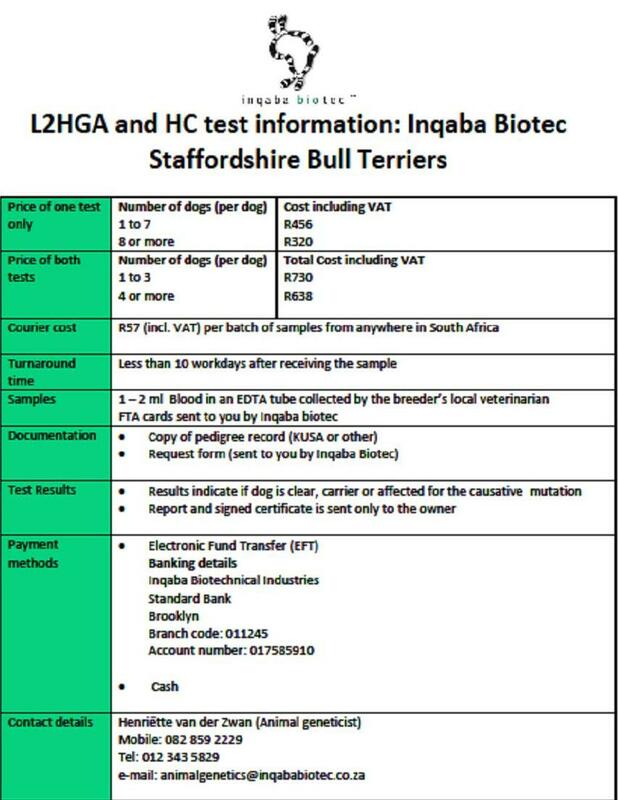 Pups which will be used for breeding can themselves be DNA tested to determine whether they are clear or carriers. Vind asb aangeheg meer informasie oor die L2HGA en HC toetse asook die toets aanvraag vorm. vir jou moet verduidelik sal ek dit met graagte doen! Moet asb nie huiwer om my te kontak indien jy enige verdere informasie benodig nie!